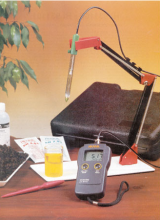 The Lutron PH-220S is designed for measuring pH in soil. It consists of a handheld digital meter with LCD screen and a spear tip probe on a 750mm cable. 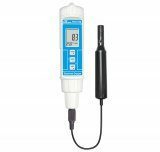 This probe has a durable glass measuring spear which is contained in a rugged epoxy body. 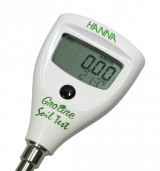 It is ideal for measurement of both soil and other semi-solid substances. 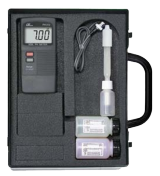 This meter has a measurement range of 1 to 13 pH with a resolution of 0.01 pH. The PH-220S is powered by one AAA battery (included). 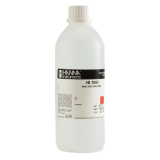 pH 4 / pH 7 buffer solutions and a user manual are also supplied. 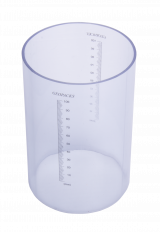 * Accuracy: ± 0.07 pH (pH 5 to pH9); ± 0.1 pH (pH 4 to pH 4.9, pH 9.1 to pH 10); ± 0.2 pH (pH 1 to pH 3.9, pH 10.1 to pH 13).